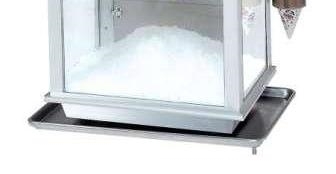 This 18" x 26" Heavy Duty Aluminum Pan is commonly used to capture melted ice and condensation from under Snow Cone Machines. A plastic hose is included to drain to your desired location. Includes plastic drain hose and clamp. 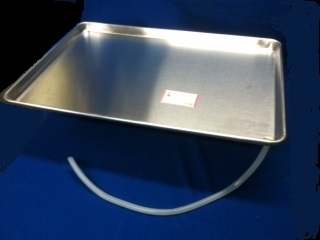 Heavy-duty aluminum 18" x 26" Sno-Kone Drip Pan with hose & clamp is the perfect unit to catch and drain excess liquids away and into a desired site. Required and recommended accessory to drain condensation and melted ice below the snow cone machine. This unit is sold individually.